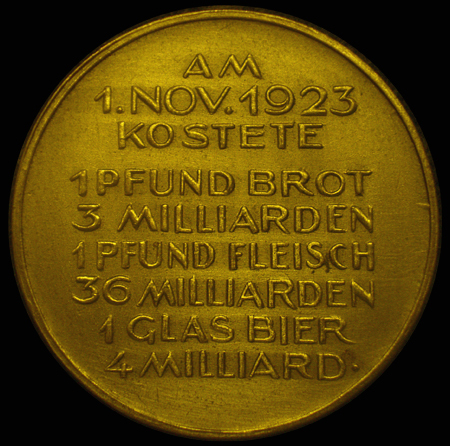 German bronze medal minted and issued in Saxony commemorating the devastating hyperinflation in post WWI Germany listing the cost of different common goods on November 1, 1923. 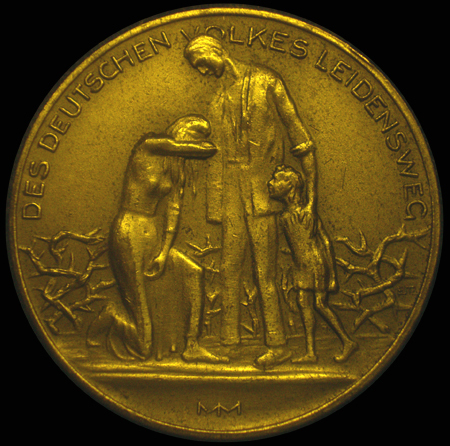 Weimar Republic Hyperinflation: This is one of several variants of a medal issued to commemorate the rampant hyperinflation that led to the collapse of the German economy in late 1923. The Treaty of Versailles (signed in 1919) required Germany to pay 132 billion gold marks in reparations to cover civilian damage caused during the war. Germany made an initial payment of 250 million in gold in August of 1921 which put a tremendous strain on the German economy and began a slow but steady inflation, as well as an increasingly rapid devaluation of the mark, as the government could not back the value of its currency with a depleted gold reserve. To pay reparations, Germany began printing of bank notes en masse in order to buy foreign currency, which then used to pay reparations, greatly exacerbating the inflation of the paper mark. With dwindling gold reserves and little trade, Germany asked for a moratorium on payment which was granted in May of 1922. This same year the value of the Reichsmark plummeted and Germany continued to claim it was unable to meet its obligations. After repeated failures by Germany to make reparation payments, France and Belgium, believing that Germany was able to pay and was instead simply withholding payments, occupied the industrial Ruhr region on January 11, 1923 which is referred to as the Ruhrkampf. In response, the German government of Chancellor Wilhelm Cuno reacted by announcing a policy of passive resistance causing the productivity and regional economy of the Ruhr, the industrial heartland of Germany, to screech to a halt putting further financial strain on the already faltering German economy. In answer to the strike and acts of sabotage by the German people, the occupation forces began mass arrests and deportations. As businesses lost income and those left without a paycheck by the Ruhrkampf required financial assistance from the governemnt, tax revenues shrank while financial obligations rose putting even more of a financial burden on the Government. The government's answer was to cover its need for funds by printing even more money and releasing even more currency into an already saturated economy. As a result, inflation went into overdrive and the economy went into a freefall resulting in hyperinflation. For most of the first half of 1922, the mark was worth about 320 marks per dollar but in December the it rose to 7,400 marks per US dollar. By November 1923 the exchange rate was 1 dollar to 4,210,500,000,000 German marks. From November 1, 1923 to November 15, 1923 represents 2 weeks of the most severe hyperinflation in Germany. Prices increased by about 2500% within that time frame. Seeking to resolve the crisis, On November 16, 1923, the Central Bank of Germany began to issue a new currency: the Rentenmark. The Rentenmark translates to Pension (or mortgage) Dollar. As there was little gold available to back the currency, Finance Minister Hans Luther, with the help of economist Karl Helfferich, sought to create a currency backed by real goods. This new currency was backed by the land used for agriculture and business. This was mortgaged, largely with significant input from US business, for roughly 3.2 billion Goldmarks. The exchange rate was 1 Rentenmark to 1 Trillion Deutsche Mark. 1 Rentenmark was equivalent to 1 Goldmark. Effectively cutting off 12 zeros from the prices of all goods & services and effectively ending the hyperinflation crisis. While many will claim that it was the eventual return to the Gold Standard that was the cure to an economy destroyed by the use of so called 'fiat' paper money. It was, in fact, the valuation of Germany as a nation along the lines of its land and resources, ALL its holdings, not just gold, that stabilized the monetary system. Germany simply had to return to the gold system after its recovery as the rest of the world was on the gold standard. It is this more realistic, holistic way of assessing the value of a nation and the power of its currency that is now the standard instead of basing monetary worth on simply how much gold a nation can hoard to back its currency. Contrary to what some may say, there is little similarity between the German economy and monestary system of the early 1920's, strained by post war issues and demands leading to hyperinflation, and the modern US, and world, economy. Top: Weary and suffering man, woman and child with thorny hedge in background. - DES DEUTSCHEN VOLKES LEIDENSWEG MM / The Suffering of the German People Issued by: E. Mitlehner at the Mittweidar Metal (MM) Goods Factory Below: AM 1.NOV.1923 KOSTETE - 1 PFUND BROT 3 MILLIARDEN - 1 PFUND FLEISCH 36 MILLIARDEN - 1 GLAS BIER 4 MILLIARD. / November 1, 1923 Costs: 1 Pound Bread 3 Billion - 1 Pound Meat 36 Billion - 1 Glass of Beer 4 Billion.